The Commonwealth of the Northern Mariana Islands is a group of islands in the Pacific Ocean that are a political division controlled by the United States. Its capital is Saipan. 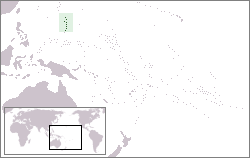 The Northern Mariana Islands, together with Guam to the south, compose the Mariana Islands. The southern islands are limestone, with level terraces and fringing coral reefs. The northern islands are volcanic, with active volcanos on Anatahan, Pagan and Agrihan. The volcano on Agrihan has the highest elevation at 3,166 feet (965 m). Anatahan Volcano is a small volcanic island 80 miles (130 km) north of Saipan. It is about 6 miles (10 km) long and 2 miles (3 km) wide. Anatahan began erupting suddenly from its east crater on May 10, 2003, at about 6 p.m. (0800 UTC). It has since alternated between eruptive and calm periods. On April 6, 2005, approximately 1,800,000 cubic feet (50,970 m3) of ash and rock were ejected, causing a large, black cloud to drift south over Saipan and Tinian. This page was last changed on 12 July 2013, at 18:42.